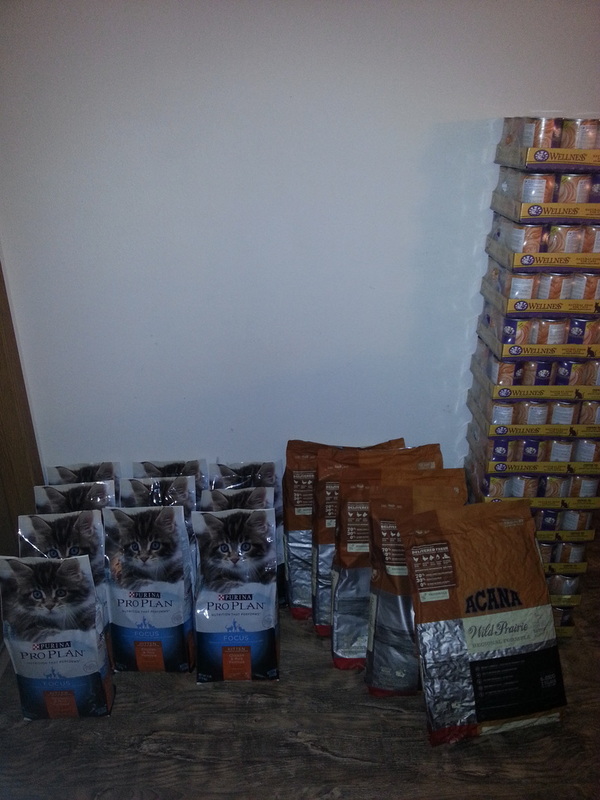 Above is a photo showing a typical "stock up" of the wet and dry foods I currently feed my Bengals. I am not currently feeding raw due to my cat-food-dedicated freezer stopping working which caused me to have to throw away almost 50 pounds of prepared raw food because it went bad (not cool!). I MIX THESE 2 DRY FOODS TOGETHER FOR A 50/50 DRY MIX. The Wellness wet food is grain-free. I get all this food shipped to me (free shipping) from www.Chewy.com. This is an excellent site for pet products! Below are 3 slideshows showing the process of how I make my home-made cat food. The only thing I forgot to photograph was the organ meat (hearts and livers) which I also add in. I use 80 pounds of human-grade whole chicken thighs (including the bones) as the basis for my large batch of cat food. The first slideshow shows the chicken thigh preparation which includes lightly baking them (after also washing them) to kill any surface bacteria, the second slideshow shows the add-ins (except the organ meat), and the third one shows the actual grinding and packaging. Please note that the outdoor temperature at that time was just below freezing, thus I was able to set the chicken thighs outside overnight the day I purchased them, so I could begin making the food the next morning; and then when finished, I was again able to set the food outside overnight before taking all of it over to my cattery to place in my cat-food-dedicated upright freezer. I will try to add more written information about my recipe and process in the future. After MUCH research, and investing in a high-quality Weston #12 commercial-grade grinder, I began feeding all my adult bengals one meal of Homemade RAW Chicken thighs (with ground bones) plus organs (with supplements added) a day, which really is the best possible food for cats, who are obligate carnivores (strict meat-eaters). If you spend much time researching cat nutrition, you will discover that even the cheapest wet food is still much better than the "best" dry food (for many reasons, but most importantly: way too many carbs in most dry foods (cats are only supposed to have 5% carbohydrates and dry food is frequently above 40% carbs!) and way too little water in dry food), but the absolute best we can do for our cat's health is using a good recipe and making our own wet food from raw meat. Several books and many websites and articles have already been written by experts in cat nutrition, so I will not attempt to go into depth about it here, but here is one link to a very informative and in-depth veterinarian-authored website about cat nutrition which includes a recipe for preparing homemade cat food. On this website, Dr. Pierson also explains why dry food as a main food source for cats (and even dogs) is so bad: ﻿http://www.catinfo.org/?link=makingcatfood﻿. I choose to go ahead and always have dry food available in gravity-fed hopper-style feeders for all of my bengals (and separate ones for my dogs, too) simply because I can't stand the thought of any of my animals getting hungry at all between wet meals. But the vast majority of their food is homemade raw chicken blend in the morning and wet canned food in the evening.